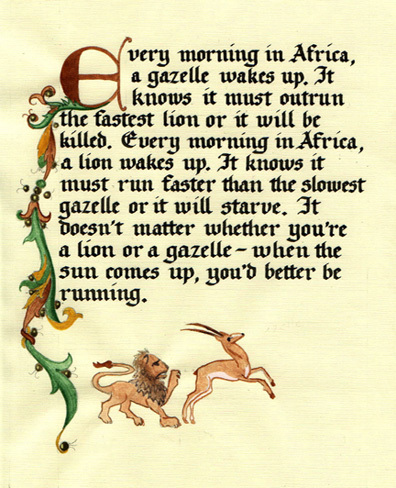 Do you have a favorite quote or poem that you want lettered? Certificates designed or filled in? I can do them in any of the fonts you see on my website. See below for some samples of special orders I have done. 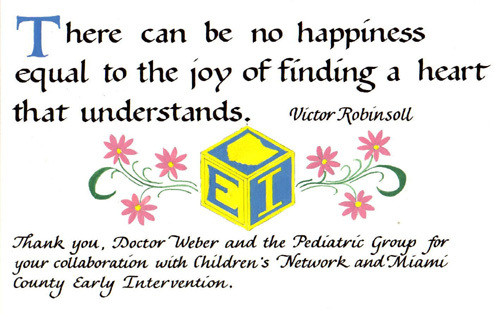 Every year the Children's Network and Early Intervention group of Miami County, Ohio gives an award to a local pediatrician. This is for outstanding service to the 2 groups who seek out at-risk children and try to make sure that they get the help that they need as soon as possible. "At risk" refers to those children who, for a variety of reasons may have a better than average chance of having a disability. I did this piece for a client whose husband recently got his graduate degree. It is one of his favorite quotes. It is 11"x14". 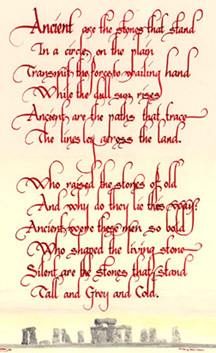 The calligraphy is Palomares lettered on a watercolor painting. This was a Christmas present for a client's brother. It was 16"x20". It was done on Bristol board with ink, watercolor and gouache. 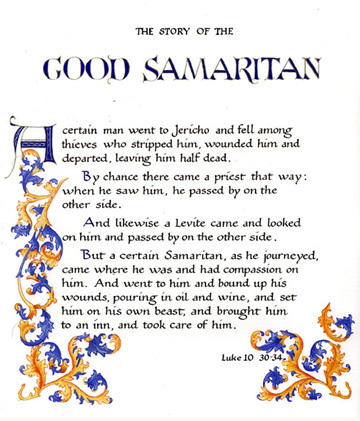 This is the story of the Good Samaritan. I lettered this for all of the nurses in the intensive care unit at Good Samaritan Hospital in Dayton, Ohio. 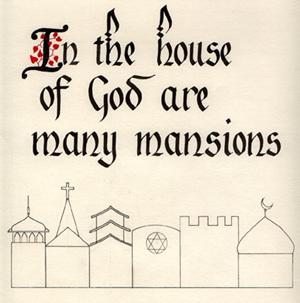 Calligraphy is Bookhand with Gothic decoration. 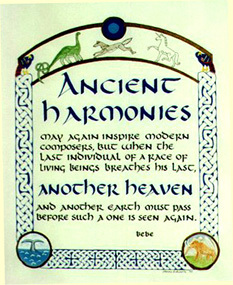 "Ancient Harmonies" is done in a Quasi-Celtic style. The knotwork and the larger text are in ultramarine or royal blue. 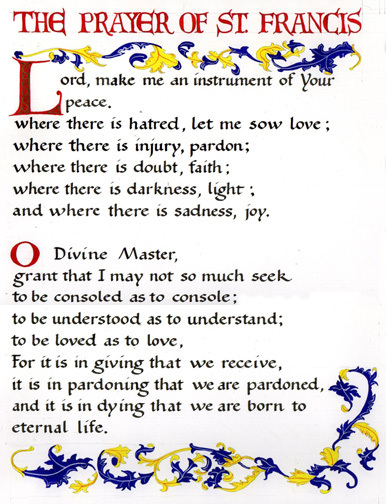 The text is in the uncial style and is in black ink. 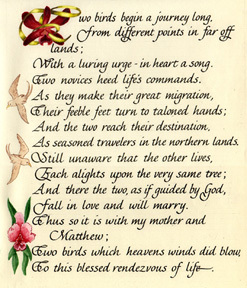 The decoration and larger text are done in gouache and watercolor. This is my interpretation of Jesus's words. The lettering is Bastarde with some extra florishes on the top. "Stonehenge" was a piece that my husband did after a trip to England. It is on white rag paper with red ink and watercolor. This is a piece that I did for a client as a gift to her mother. It was done on white Bristol board. The lettering style is Vivaldi. 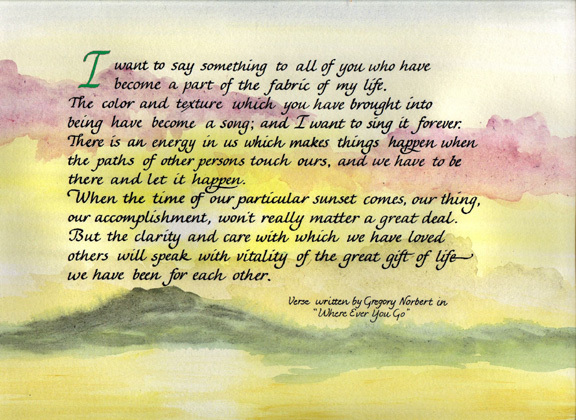 I did this piece for my parents' fiftieth wedding anniversary. I had heard these things all throughout my childhood, so this seemed a good time to tell them that I really had been listening. If you want one of these with your parents' sayings I will be glad to do it for you. Please email us for the price. This is a piece that I did for a couple's new home. Their last name began with a B. You may order the same piece with your initial and your colors. This was a Christmas gift for a client's boss. It was 11"x14". 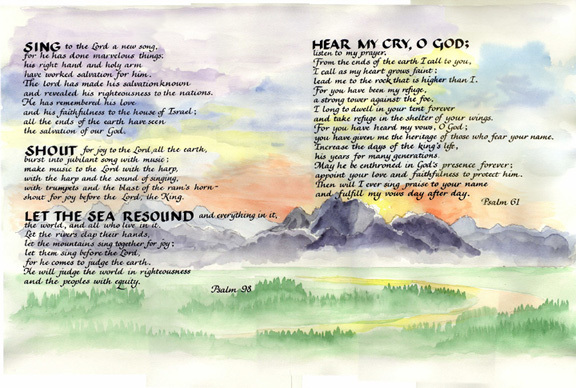 It was done on cream colored linen finish paper with ink, water color and gouache. The lettering style is Blackletter and the decoration is a Gothic style. This was a piece we did for a couple's wedding. It's another interpretation of 1st. Corinthians, 13. It was done on Bristol paper in black ink. The alphabet is Palomares. It was done on 11"x 14" paper. Of course all the other choices (colors, decoration, etc.) would be yours. This is a piece that I did for a couple's new home. He is an arborist and his wife is a chef. His mother contacted me and asked me to work their two professions into the decoration. That's why a house blessing is decorated with a picnic under a tree. 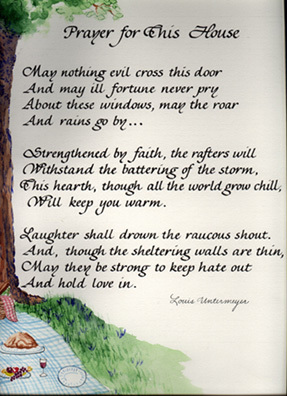 By the way, I am aware that there is another verse to this poem, but this is what my client wanted. 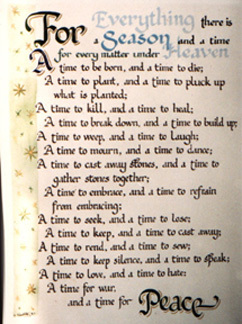 This poem was written by my client. She asked me to letter it for her and decorate it to match a room that she had redecorated. 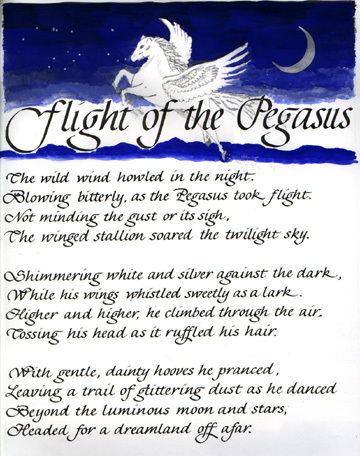 The pegasus came from her website.The size is 16"x20". 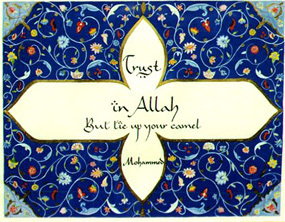 This piece is done in an Islamic style. The background is meant to look like a Persian rug. It is done on white paper with India ink, gold ink trim and gouache and watercolor background. 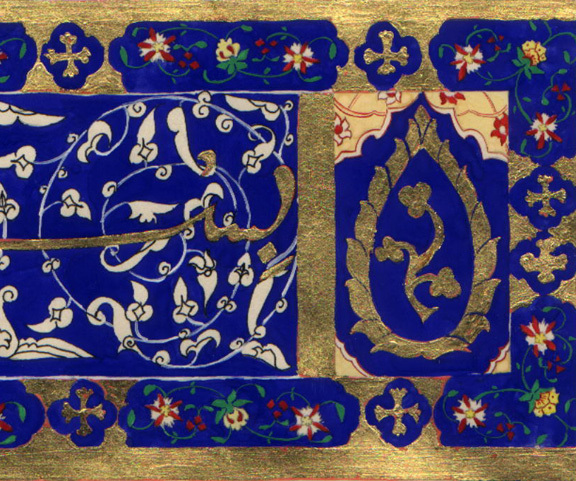 The blue of the background is ultramarine (royal blue) and the calligraphy style is Legend. This is another commissioned piece. It was done on white paper with black ink and blue and green watercolor. It is 11"x14". This is a piece that I did for my uncle who makes his own wine. 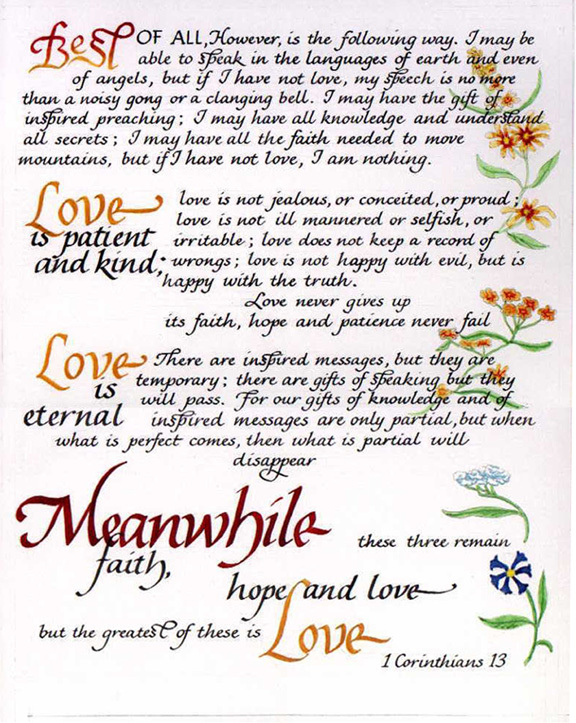 It was done on tan parchment with black ink. The alphabet is "blackletter". 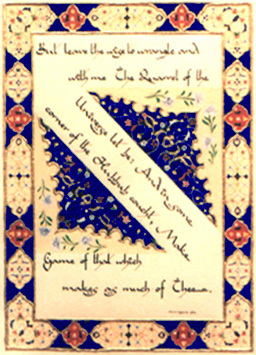 The illumination is done in the style of the 15th century "Rohan Master". 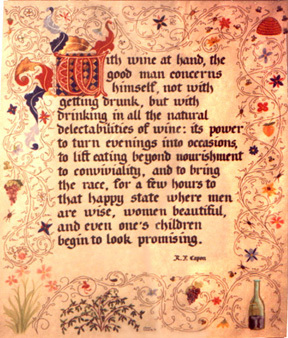 I included this piece as an example of illumination and lettering. 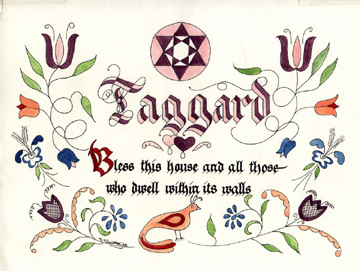 This is a house blessing done in Pennsylvania German or "Fraktur" style. It is 11"x14". 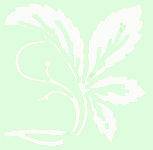 These are not traditional Fraktur colors, which are usually red, blue, green and yellow. However the choice of colors is up to you. (Right) In the 15th. and 16th. centuries Moslem scribes produced some of the most spectacular illuminated manuscripts ever seen. This is my humble attempt to produce a page in that style. I used 100% rag paper, ink, watercolor, gouache and 23K gold leaf. It represents about 100 hours of research and actual work. 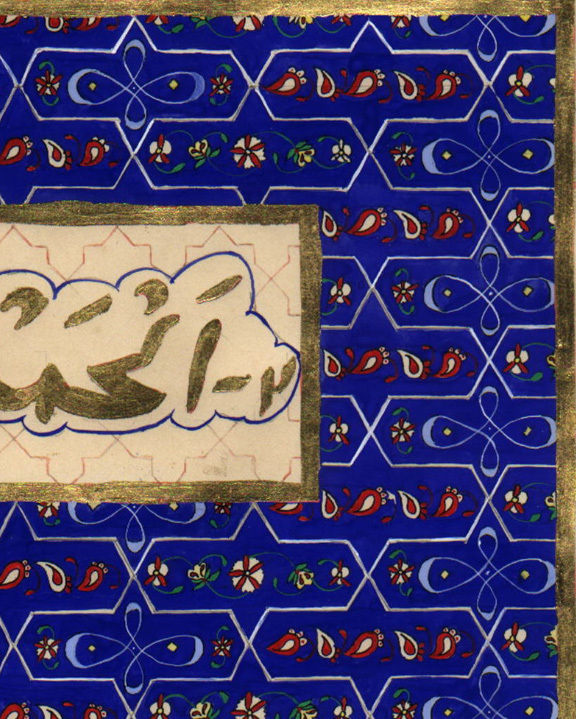 The writing in the top panel is the "Bismallah" and means "In the name of God, most gracious, most merciful". 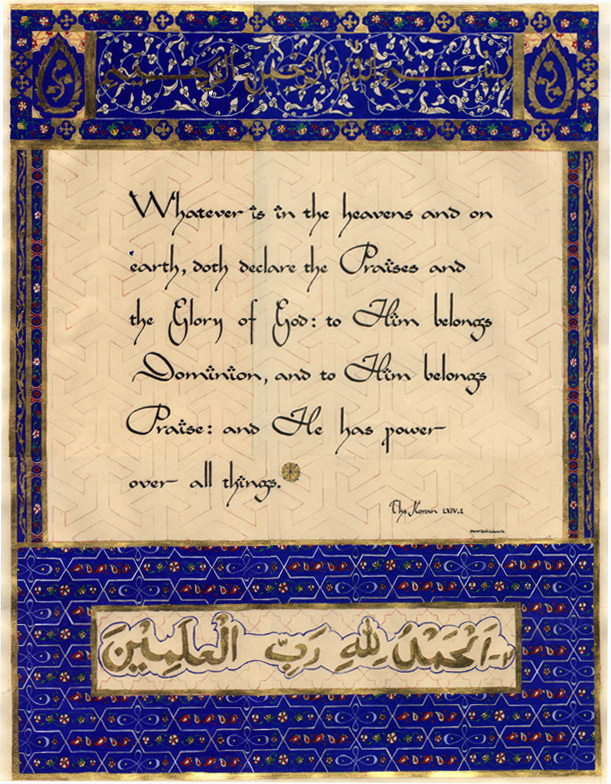 The writing in the bottom panel is also in Arabic and says something to the effect of, "Praise be to God, the cherisher and sustainer of the Universe." The piece is 20"x30". If you would like to see a few details from this, scroll on down. I did this many years ago and am often asked if some of the design was already on the paper. It was not. I started with a blank piece of paper. See below for details. (Left) This is a detail from the upper right corner. 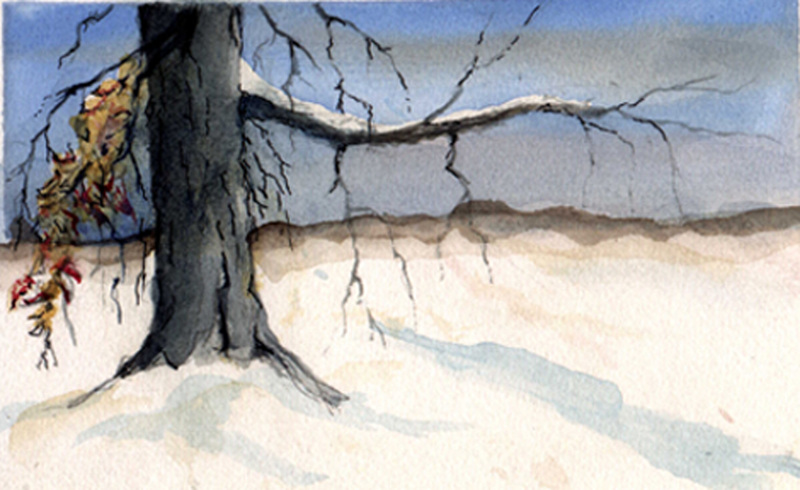 The area shown is approximately 3"x5"
(Right) This detail is from the bottom right area of the page and is approximately 5" x 6"
Below are prints of watercolor paintings we have available, Contact us for more information. 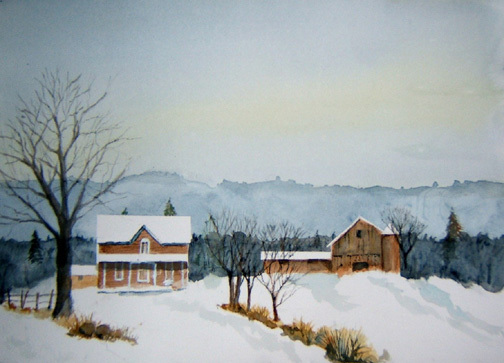 This is "Farm in Winter"
Below is "The Passing of the Backhouse"
A weather-beaten object looms through the mist of years. And hurrying feet a path had made straight to its swinging door. But in the tragedy of life it played a leading part. To see the modest hired girl slip out with glances shy. We had our posy garden that the women loved so well. And told the night-o'ertaken tramp that human life was near. Delightful where my grandsire sat and whiled away an hour. And berry bushes reddened in the streaming soil behind. That flitted to and from the house where Ma was baking pies. And once a swarm of hornets bold had built a palace there. They stung my unsuspecting aunt--I cannot tell you where. Then Father took a flaming pole; that was a happy day. He nearly burnt the building up, but the hornets left to stay. We banked the little building with a heap of hemlock boughs. In sooth, the building was no place where one would wish to stay. We tarried not, nor lingered long on what we left behind. The torture of that icy seat could make a Spartan sob. That from a frost-encrusted nail was suspended by a string. My father was a frugal man and wasted not a thing. We bundled up the dear old man with a muffler and a shawl. And once I dared to sit there. `Twas all too wide I found. My loins were all too little and I jacknifed there to stay. They had to come and get me out or I'd `a passed away. And I must use the children's hole `til childhood's days were done. And in the lap of luxury, my lot has been to sit. But ere I die, I'll eat the fruit of trees I robbed of yore. And seek the shanty where my name is carved upon the door. I ween the old familiar smell will soothe my faded soul. I'm now a man, but nonetheless, I'll try the children's hole. If you are interested, email me and let me know what you would like. See also the Calligraphic Hands page (Link below) for styles of lettering.